This robot searches for moving objects to play with using its compound eye to track movement. This unique sensor does not only track movement but can also be used to judge distance and communicate with other robots. 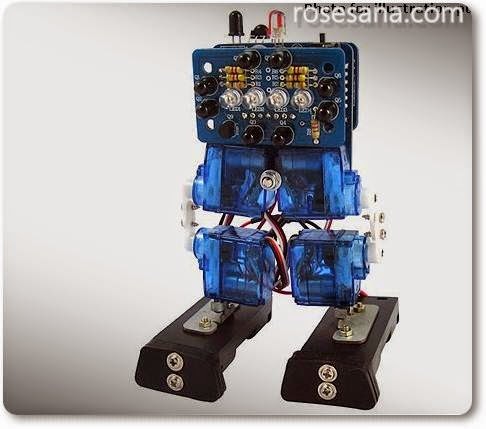 The Mini Biped Robot uses an ATmega8A processor, is AVR/Arduino compatible and is fully programmable using free software from the internet. For those first learning to program a robot, the Arduino software available on the internet is a great introduction to the "C" language. Experienced "C" language programmers can use free software from the internet such as "WinAVR" to program this robot. *Note: This robot is sold in KIT form which requires assembly.